When I got my licence in 2016, my parents insisted that my first car had to be a Volkswagen Golf and nothing else. When asked why, they reasoned it was the best hatchback available in terms of quality, safety and brand value. Where is this going you may ask? 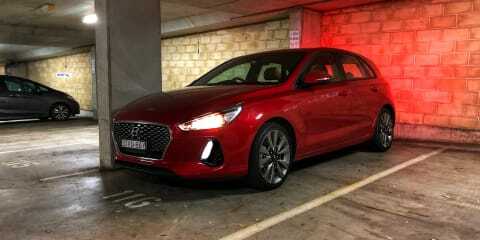 Well, I learnt manual earlier last year, thanks to a dear friend who trusted me enough to drive his car whenever I could, and I enjoyed it so much that I decided to sell my automatic Golf and buy Hyundai’s new i30 SR, with a manual transmission of course. This decision didn’t come lightly. I had many debates with my parents about it, until eventually I got the upper hand with my persistence. Nine months on, though, I can say it was the best decision I ever made. The i30 SR always had the dynamic ability and cosmetic appeal to prove it was sport focused; however, it just always seemed to come up short as Hyundai forgot the most important component – the engine. With a 2.0-litre naturally aspirated engine producing 124kW and 201Nm, it was rather asthmatic to say the least, and even by warm-hatch standards there wasn’t much to be excited about. With the new model, though, the tables have completely turned, with the peppy 1.6-litre turbocharged engine (producing 150kW and 265Nm) shared in the Veloster Turbo and Elantra SR making its way into the heavily revised hatch. The power delivery is pleasantly surprising; it’s got a strong mid-range and never seems to fall short of grunt. Rev it out and you’ll find yourself pinned to the seat, and then needing to change gears… And slowing down sooner than you expect. It’s definitely not something you expect from a Hyundai, but who’s complaining? The aural character is also meaner than its predecessor, with a burbly and mature exhaust note. However, with that said, it is on the quiet side, and when you listen to its US cousin, the Elantra GT Sport, there is no comparison (seriously look it up). The gear ratios are a little short for my liking. For instance, I wish second gear would stretch out to 100km/h instead of 90km/h, but I admit this is only a problem if you’re focused on 0–100km/h times. In the real world, this allows the car to always be in its peak torque range, and who can complain about that? What is probably even more impressive than the engine is the chassis, and how it manages to juggle two different purposes. Head on the motorway, sit back and relax, and you’ll find yourself soothed by the soft ride quality (thanks to the independent rear suspension). If that’s not quite your forte, and you’d rather take the back way to hit some corners, don’t worry, the car won’t be fazed. Instead, the steering will stiffen up, the throttle response will sharpen, the exhaust will start shouting, and you’ll find yourself conquering corners without being on the edge of your seat. Yes, it is a bit of word play, but it actually has three inferences: the first being that the seats are supportive; the second is that there isn’t too much body roll (don’t expect anything too focused, though; it’s no hot hatch like a Type R); and the third is that the car will never intimidate you, so you’ll gain confidence quickly. It’s quite predicable too. Push it too hard and it will understeer, and then lift-off oversteer. 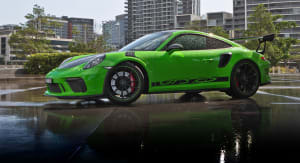 To complement the driving experience, the brakes are reasonably strong with plenty of stopping power to complement your spirited driving (that’s not permission to go to the track and expect to drive away without any fading, they aren’t carbon ceramics). Furthermore, the gearbox is well sorted, offering a well-weighted clutch pedal and smooth gearshift that you could literally do with one finger if you wanted to try. It is worth noting that the clutch pedal has a short bite point, so you’ll find the clutch mostly disengaged and the car in gear well before you even fully release the clutch pedal. The downside is that this may take time to get used to for new customers, but the bright side is that it’s effortless to quick-shift and rev-match if you’re feeling up for it. As far as the dynamic ability of the car goes, the only downside I can think of is the tyre choice. 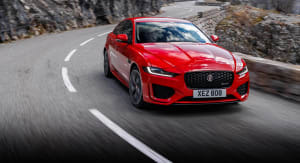 Yes, they do perform quite well once up to speed and through corners, but they can struggle to get the power down, especially if planting it in first gear or on anything but a dry surface. Combined with an overly sensitive traction-control system, you will get tired of the car cutting power almost every time you want to accelerate, and find yourself momentarily switching off traction control just to get the car to finally cave in (obviously this isn’t the best of ideas). Okay, so I think you get a picture of how the car drives, but what about everything else about it? Well, to complement its 18-inch alloy wheels and dual exhaust tips (unique to the SR range), step inside the car and you’ll be greeted by an abundance of red highlights, red stitched-leather sports seats, red stitched-leather steering wheels, red seatbelts, a red gearknob, and sports alloy pedals (not red). It all sounds a little bit silly and seems to be a raceboy’s dream, and as much as I think it’s bizarre, it does liven up the interior (let’s be real, all black would be pretty boring, and we all know that red equals fast). As for the quality of materials, it is better than average but not quite as posh as a Golf. For instance, you do get soft plastics on the door trim and all across the dashboard, but move your fingers below the dual climate system and you’ll find yourself trapped in a tunnel of hard plastics. The infotainment screen also leaves a bit to be desired. 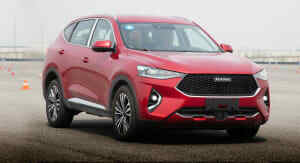 Like most other cars nowadays, Hyundai has stuck it onto the dash, and despite its impressive size (8.0 inches), the resolution is a cut below that offered by VW or Mazda, and so is its functionality (it can feel a bit laggy at times). Fortunately, despite the ‘cheap’ visual appearance of the screen, it comes loaded with standard features (yes, including satellite navigation with Apple CarPlay and Android Auto) and a range of other settings to entertain yourself with. The car also has a range of warnings to keep you out of trouble, such as alerting you of red-light speed cameras and school zones. Sounds great, but I would suggest turning most of the alerts off (honestly there are dozens) or else the car will beep and talk to you all day, and it will drive you crazy. Still, it is good to see Hyundai being proactive in the battle against accidents caused by drivers falling asleep behind the wheel. As far as space and practicality go, it is near the top of the competition. The boot is 395L, and there is plenty of storage space, such as in the doors and around the centre console, to hold things like your phone, wallet, keys, water bottle etc. For its class, there is also considerable room for rear passengers, but like most hatchbacks, if you are a tall driver, adult passengers will struggle for space and comfort. Unfortunately, there are a few ergonomic issues too, and it’s just small things that you expect the car to have given its trim. An example is single-press windows. Instead, you have to constantly press the button to wind them up or down. The driver’s display is also quite limited; it doesn’t show average speed or oil temperature (seriously Hyundai?). It does come with a tyre pressure monitor, which is cool. The infotainment system also has its inefficiencies. For instance, there is no shortcut to change a radio station. Instead, you have to select ‘favourites’, where you’ll be directed back to another screen, and then select which station you’d like, and then if you want to change it again you’ll need to do it all over again. Further, when entering a destination in the sat-nav, you have to type out the entire destination before the system will recognise it. They are petty issues, but Hyundai should be doing better. What isn’t a petty issue, though, is the lack of safety features on the manual trim that are standard on the automatic spec. 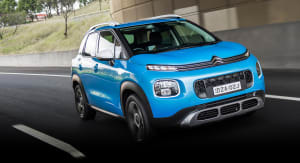 These include autonomous emergency braking (AEB), adaptive cruise control and lane-keeping assist; however, you do get blind-spot monitoring and rear cross-traffic alert. Personally, I don’t see this as a major issue, as I’m more for the ‘driving’ side of things, but for most buyers that this car will appeal to, I understand the concerns. 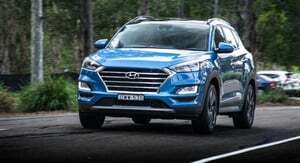 By modern car standards, Hyundai should be doing better. And what’s worse is that if you want the safety features, you can’t option them on the manual, you’ll need to move to the automatic variant. Despite offering a substantial amount of equipment and features, you can’t help but notice that you are missing out on a range of things by not choosing the premium variant. There are a lot of blank buttons, and that’s never a good look. But hey, it’s not all bad: you get a wireless charging pad, so you can distract your passengers from realising that by chucking their phone on it. I promise that’s all they’ll focus on for the next 15 minutes. 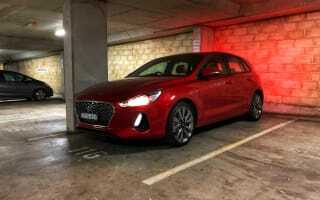 Overall, despite facing some shortcomings, the Hyundai i30 SR definitely has a lot going for it, representing sensational value for money regardless of what buyer you are. If you are anything like the millions of Australians who need a car mainly to get to work, cart the kids to school and head to the shops, it’s hard to look past the i30 SR. It’s comfortable, practical, easy to drive and well equipped. By the same token, those looking for a budget ‘pocket rocket’ or warm hatch to mainly treat to spirited driving will also be pleased. As mentioned before, the engine is potent with plenty of torque, the feel of the steering and brakes is sharp, and the chassis is well organised. As much as it may not have the history or credentials of cars like the Volkswagen Polo GTI, Peugeot 208 GTI or Ford Fiesta, it’s important to remember that those cars are still north of $30,000, and don’t come with the same level of equipment or space that this does – and yet the i30 SR is still cheaper. It may not liven you up the same way the cars mentioned above do, but when you factor in that most sales of the i30 SR will be in its auto trim to ordinary buyers, Hyundai has done well in identifying its target market and tailoring the i30 towards those interests. I think we should feel lucky that Hyundai bothered to make a manual variant given the trends of the car industry. If you haven’t already, I would definitely recommend you give the SR a go. There are still plenty on sale as a demo or with low kilometres from a private buyer. Or if you want a new car, have a look at the N-Line (which has now replaced the SR). In my view, it is a performance bargain and won’t disappoint.